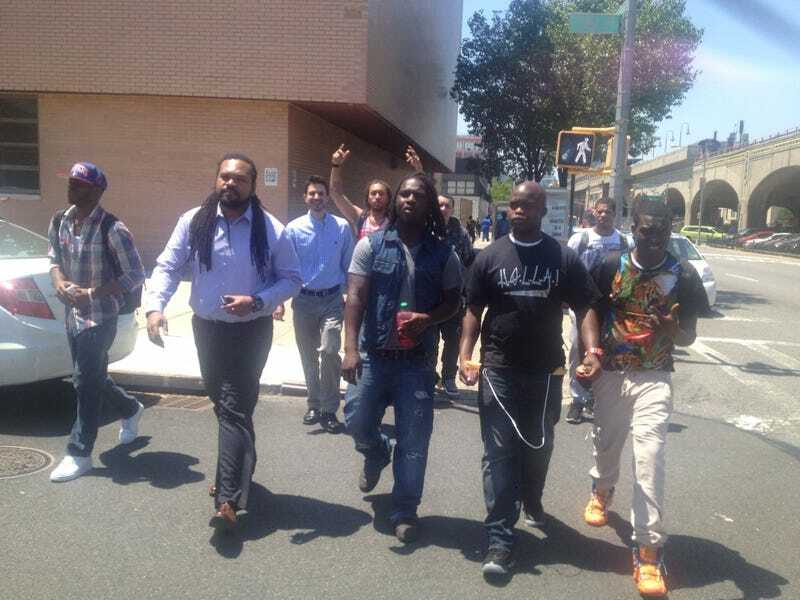 Raheem Brooks (front, left) walks with young men from the CUNY Fatherhood Academy. When mainstream media paints a picture of black fatherhood, the image is usually marred by racialized prejudices and stereotypes about black manhood in general. The boy’s father was not even at the zoo with the mother, but that didn’t matter to the Daily Mail. First the site manages to bring his criminal record into play; then, buried in the story beneath the salacious headline, the reader finds out that he seems to have “turned his life around” and dotes on his four children. So why bring it up at all? Black dads are often portrayed as cold and uncaring deadbeats. Rarely are they portrayed as being involved. Rarely are they portrayed as loving. And young black men? The mainstream media will call them “thugs” before they call them good fathers. This is a problem, because nothing could be further from the truth. Indeed, black dads, even young black dads, are doing all of that and more. They want to be involved. But a lot of the time the conversation about dad involvement revolves around monetary support. And while child support is important, it’s not the be-all and end-all. These are guys, he says, who are looking for the resources, looking for a way to take the initiative, regardless of the type of model for fatherhood that they have growing up, regardless of their relationship with their child’s mother. In recent years, the media space has gotten a bit better about its imagery. There was that adorable ad that showed hulking NFL players carefully grooming their little girls’ hair. NBA MVP Stephen Curry was beautifully featured in Parents magazine, with his wife, Ayesha, doting on and laughing with his two little girls. However, the biggest player responsible for shifting the narratives around young black fathers is social media. Why? Because the news comes straight from the source itself: young black fathers boasting about their babies, posting videos of themselves playing with their babies, chronicling their lives with their babies in daily vlogs like the amazing ones done by La Guardia Cross. The times are a-changing, and the truth is coming out. “[Young black fathers are] the biggest billboards and messages. The messaging is within them. To hear from them specifically is great. Education is not the only thing, but it does tend to be an equalizer,” Brooks said. And volume is also key. The more young black fathers step up on social media, unabashedly being their amazing, dadlike selves, the harder they are to ignore. Individualized platforms are powerful, especially when they show things that are different from what people normally read or hear. “The end point of having those platforms around, I feel, continues to break those barriers down and get people to look at it differently. When we have the opportunity to have media come in the room and listen to some of the stories of young men … it’s always exciting for us because we tell our young men, ‘You all are myth busters … knocking those barriers down,’” said Sheldon Smith, the founder of the Dovetail Project, a Chicago-based organization that teaches young dads parenting skills and gives them other resources to better provide for their families.